A youngster holds her Sixers jersey at Fan Appreciation Night. A YEAR AGO, this was an event that would go down in 76ers infamy. 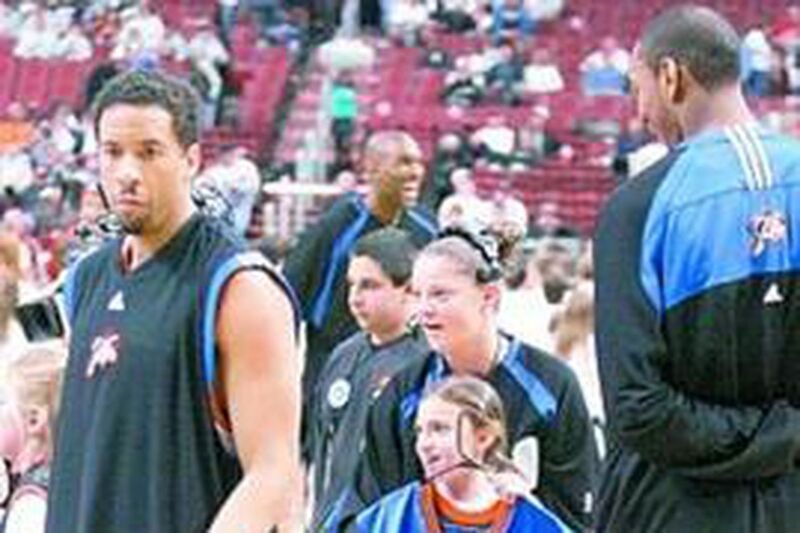 The climax didn't come until the Dec. 19 blockbuster trade with the Denver Nuggets, but Fan Appreciation Night 2005-06 was the beginning of the end of the Allen Iverson era in Philadelphia. That was the night Iverson and Chris Webber showed up only minutes before tipoff. Neither sat on the bench for the game. That was the night Sixers president/general manager Billy King went ballistic and delivered an X-rated soliloquy. That was the night that determined everything had to change. A year later, it has. Unfortunately for the Sixers, this year's result was different from last year's, too: This time, they lost their final home game, dropping a 98-92 decision to the Cleveland Cavaliers. Iverson, the face of the Sixers franchise for a decade, is in Denver. Webber was given about $36 million simply to leave town, and now plays for the Detroit Pistons. Well if King did any swearing, it was in the privacy of his suite in the Wachovia Center. But there was little for the Sixers' head honcho to get riled about. All of the Sixers, including the injured Andre Iguodala, Kyle Korver, Rodney Carney and Shavlik Randolph, were in the building well within the team's guidelines. Iguodala took the microphone and addressed the 17,693 fans in attendance. The entire night was for the Sixers to celebrate and thank a fan base that stuck with them through a massive and occasionally frustrating transition. "All I can say about tonight is our guys and our fans were able to enjoy the night," King said. "Our players were able to show their true appreciation for what [the fans] meant to us all year, because it was truly a difficult year." A culture change, the one King talked so much about in the aftermath of the last year's fiasco, is happening. It might not have come about in the way expected, but the climate around this team couldn't be any more different than it was this time last year. As last season ended, the Sixers had won 38 games, but clearly were going nowhere. They seemed determined to stay stuck in the quagmire of confusion and mediocrity the Iverson era had become. This season, the Sixers (34-47) will finish with fewer victories, but at least they have a direction and mission that everyone in the organization seems on board with. The tearing down of the status quo happened, the rebuilding began, and, to the surprise of many, the foundation might be stronger than anyone thought. "What this season has meant to me as management is that we were able to evaluate and have a better idea of where we are," King said. "I like where we are. "I like the fact that a lot of our players had individual success from all of their hard work. Now the draft is coming, and we can focus on that to make this team better." Some have complained that the Sixers accomplished nothing by going 29-29 since the Iverson trade. They've argued that winning was not only meaningless, but also irresponsible, because it will give the Sixers fewer ping-pong balls in the NBA draft lottery. As I've said many times before, I vehemently disagree with that stance. Of course, acquiring a stud prospect like Greg Oden or Kevin Durant is the ultimate wish for the draft. It could still happen if the Sixers get lucky in next month's lottery. But beyond the total lack of integrity in tanking games, I like that this team showed a pulse after everyone, including myself, declared them dead after Iverson left. Wanting to win counts, because it puts you in a mind-set to try to achieve more. "I focus on the second half [of the season]," Sixers coach Maurice Cheeks said. "I see positives with the players that we have. "We have a young nucleus of players, but they understand that they have to make another step. We have guys that have a passion for the game, and when you have a passion for the game, you know you have to get better in the offseason."